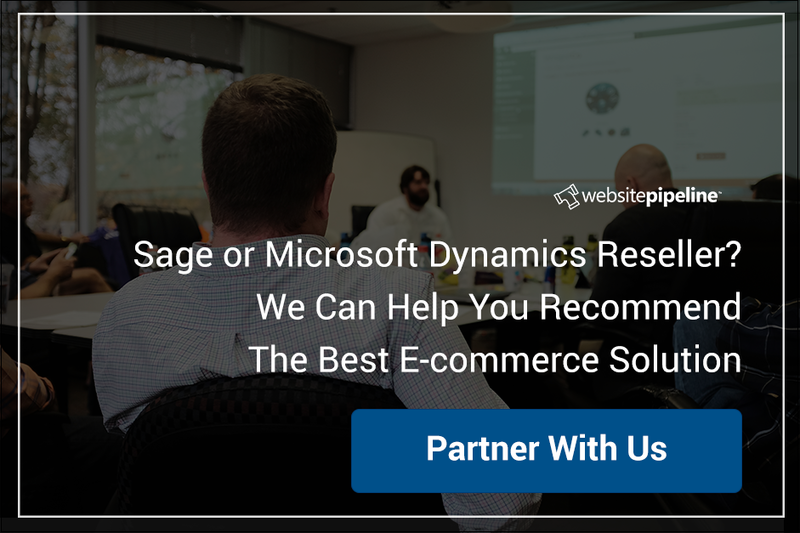 If you follow our blog, you’ve no doubt seen our recaps of the various events we attend around the country in the ERP community. We share what we learned, what we shared, and of course, pictures of who we shared it with. There’s often pointing involved. But this one is a little different. 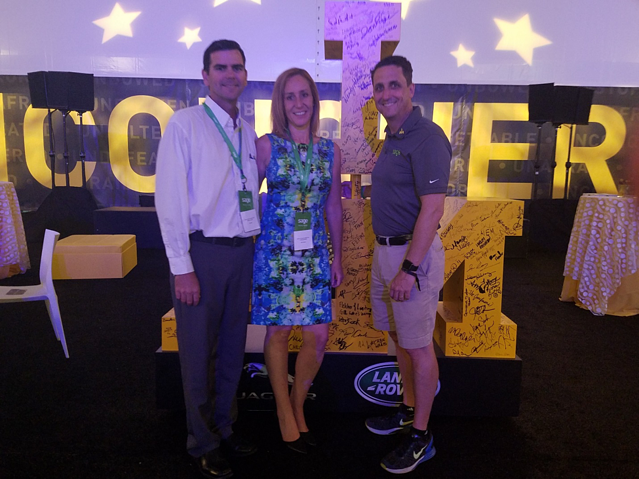 I was recently invited by Sage to spend a day at the 2016 Invictus Games held from May 8 – 12 at Disney’s ESPN Wide World of Sports Complex in Orlando, and it is a day I won’t soon forget. 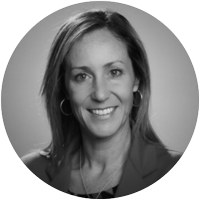 Yes, Sage, who has committed to a multi-year partnership supporting the Games, was an incredible host to me and the other partners who attended. They pretty much provided a true Disney experience to us guests! But after spending the day with them, I’ve decided that’s not the part they’d want me to tell you about. 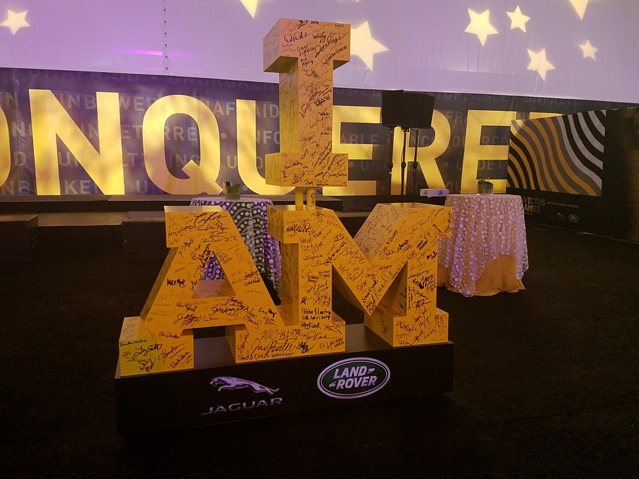 To really understand what the Invictus Games mean to the international service men and women who’ve suffered life-changing injuries while serving their countries – and to their families – you really need to visit their website www.invictusgames2016.org. 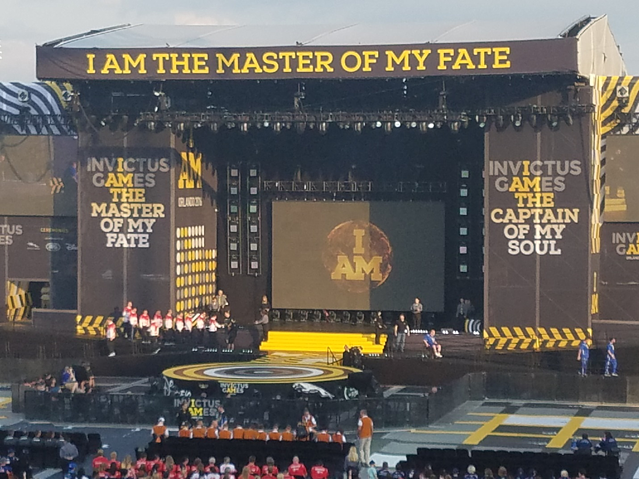 Watch some of the highlight videos and read the Invictus Story. When I asked the Sage representatives which events they had enjoyed most so far, every single one of them got a little emotional. There was a mixture of humility in the face of the strength and determination of the athletes, and pride to be part of Sage and supporting the event. Fan favorites seemed to have been the swimming and the wheelchair rugby. 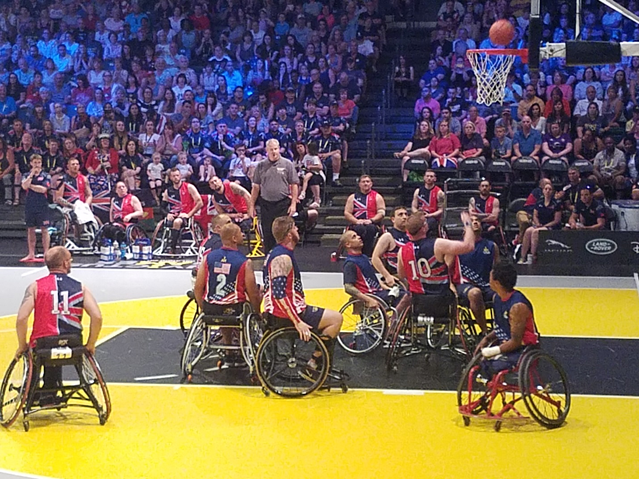 Here’s a brief clip, please note that #1 on the US team has only one hand and is missing most of both legs: Invictus Games Rugby. Incidentally, he was one of the top scorers in the wheelchair basketball, where the US defeated the UK in the finals to win the Gold. Feeling like a slacker yet? I know I did! There wasn’t a sense of “look at our brand” or “make sure everyone knows we’re doing this”. I’m all about promoting brands, but that just wasn’t what it was about. The Sage representatives (there were dozens of Sage employees and their family members on hand, many from across the Pond) were taking this service to heart. Here are some pictures I took and a few Twitter posts I borrowed, but if you check out Twitter and the hashtag #SageServingHeroes there are many tweets out there that really tell the story better than I can. 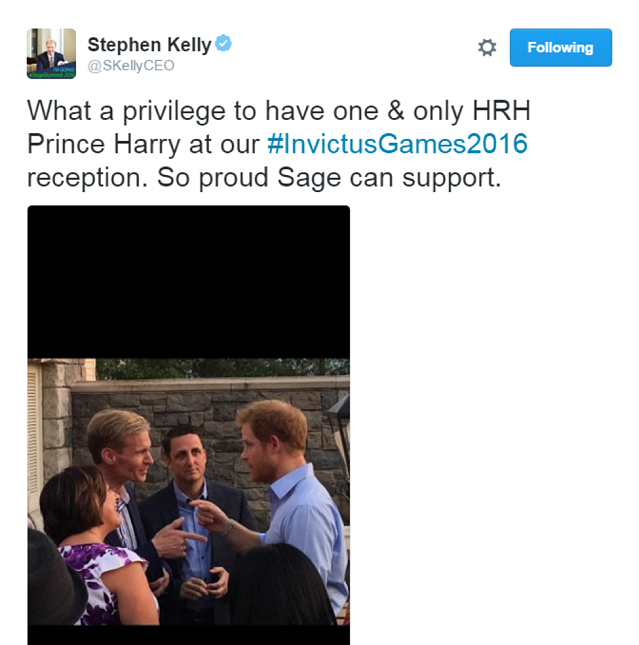 I want to thank Sage for including Website Pipeline in this event, but more so for being a supporter of the Invictus Games and making all of us in the Sage community proud to partner with them! 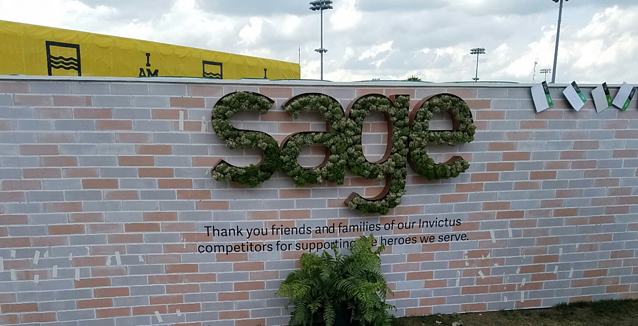 Earlier in the day, this wall had been covered by notes from Sage employees and their families to the loved ones of the competitors. 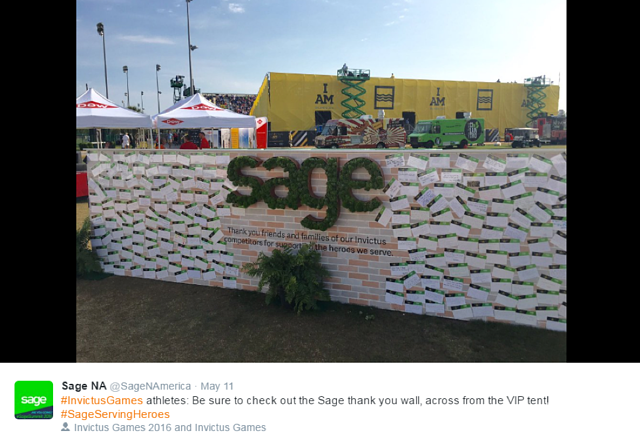 We caught them as they were taking the notes down, and we said we were bummed that it was coming down, but the Sage team told us that they were planning to take every one of the notes and make them into a digital book for the athletes and their families. 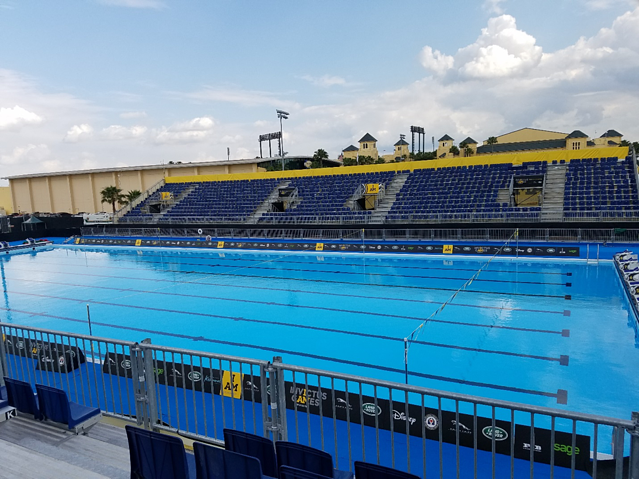 This swimming pool was actually constructed on top of a field just for the Games. This was not your average Central Florida above-ground pool! The US team won the Gold in wheelchair basketball. The sportsmanship both on the court and off was great. Pretty much everyone cheered for a great play, a basket, or a recovery from a toppled chair (which wasn’t uncommon), regardless of which country they call home. 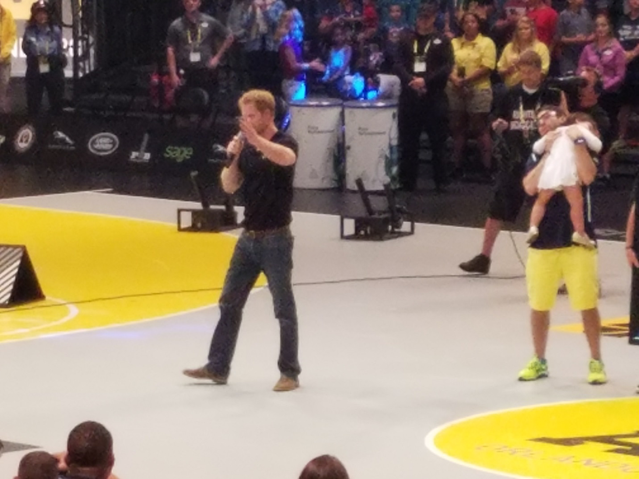 Prince Harry, who conceived of the Games to help these competitors be recognized for their achievements and not given sympathy, was a regular fixture around the complex, by all accounts blending in casually with the crowds. Here he came out on the court to congratulate the medalists in the wheelchair basketball. The Closing Ceremony included awards and inspiring stories of the journeys of several of the teams and their athletes. We also got to see performances from major acts like Rascal Flatts, Rachel Pratten of “Fight Song” fame, Phillip Phillips, Flo Rida, and more. Tim Boerio (Alliance Solutions Group) and I had a personal meet and greet with Sage North America President, Marc Scheipe, who took time out from his busy schedule to be on hand for most of the week supporting the cause. And as it turned out, there was some pointing. Of course there was.